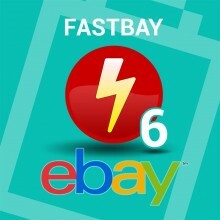 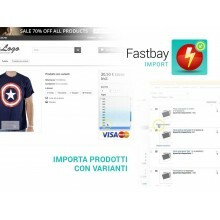 FASTBAY Import is the professional solution that allows you to import your products from eBay to Prestashop in minutes. This module is the best way to import and synchronize all of the eBay store products with your eCommerce PrestaShop. 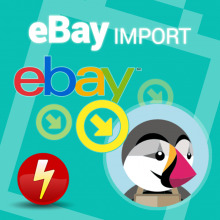 Import your catalog eBay in PrestaShop is simple and fast, thanks to dedicated options allows for maximum flexibility. 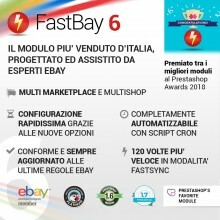 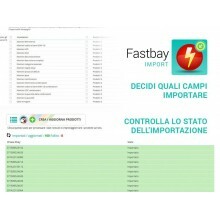 The "FastBay Import" module allows you to create or update your e-commerce starting from eBay data.For the full control of the timing and eBay orders even from Prestashop to eBay you can evaluate the "FastBay" module, the new official form available on eBay Addons.